If you’ve never had huevos rancheros, this is the time to start. Trust me, this Mexican breakfast is 100% worth the effort… And there’s not actually that much effort. 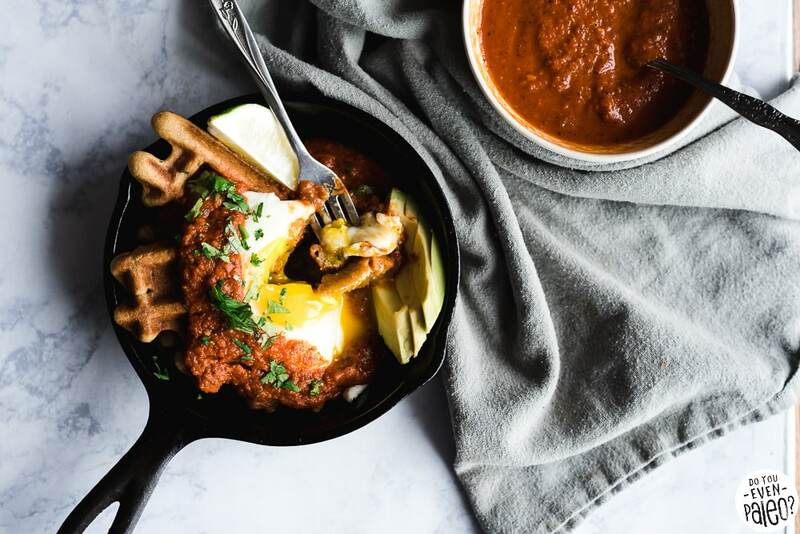 You’re going to make these epic paleo cornbread waffles, then top them with a quick homemade salsa and fried eggs. Add some avocado and cilantro to round the meal out and make it pretty. And there you go. 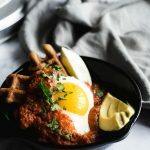 Waffles huevos rancheros! 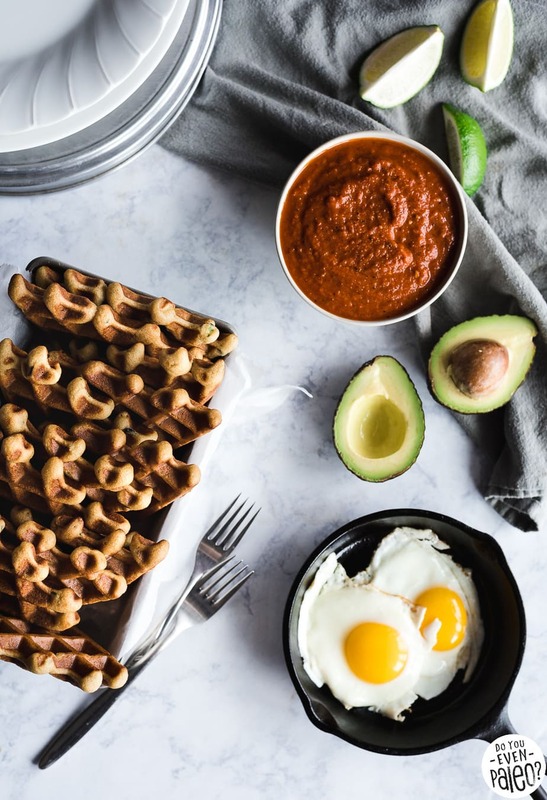 And one of the best parts (to me) is that you’ll have leftover waffles and salsa. 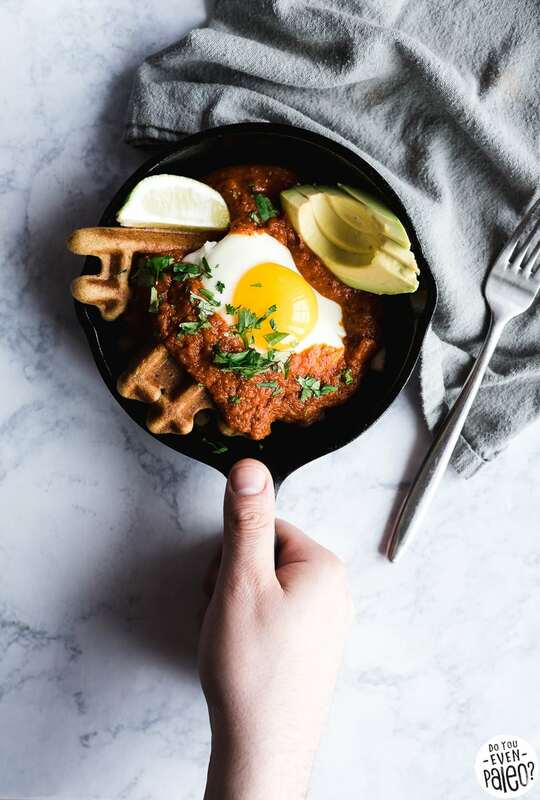 You can easily take those leftovers and construct huevos rancheros again and again each morning! I’ve got to tell you, I’m enamored with making my own salsas. Homemade salsa is so easy! And there are so many ways to customize it. The salsa in this recipe isn’t your run-of-the-mill, storebought salsa. You’ll use dried chipotle and arbol chiles to bring this salsa to life. I know, dried chiles can seem a little daunting at first. But there are a couple reasons to reconsider that assumption. First, dried chiles keep for a long time because they’re dried. So the rest of the package will be safely waiting in the pantry for your next salsa-making day. Also, FLAVOR. So much flavor! Dried chiles add a depth of smokiness or sweetness or heat to salsa, depending on the chiles used, in a greater variety than depending on jalapenos or whatever other fresh chiles are available (in Fargo, ND, that’s a real problem). So, even though this recipe requires making your own salsa, you won’t regret it. 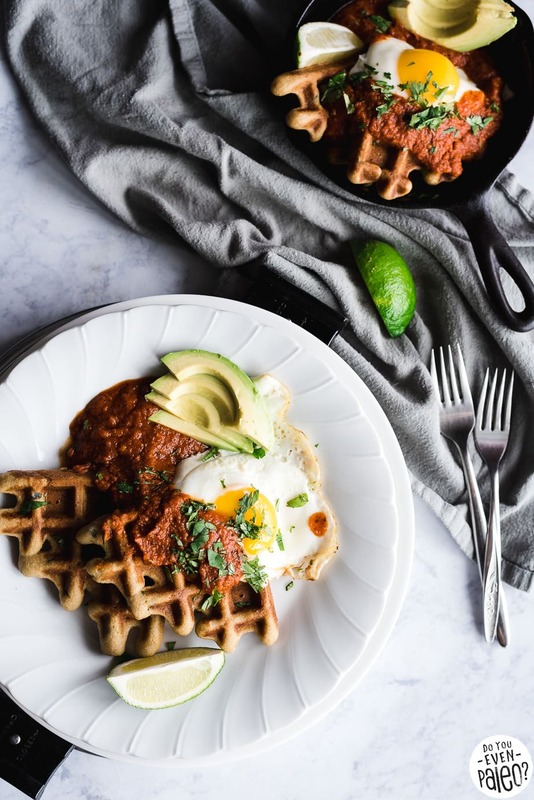 Plus, you can use the leftover salsa for much more than just waffle huevos rancheros. Introduce some Siete Tortilla Chips to this salsa and we’ve got a serious party going on! 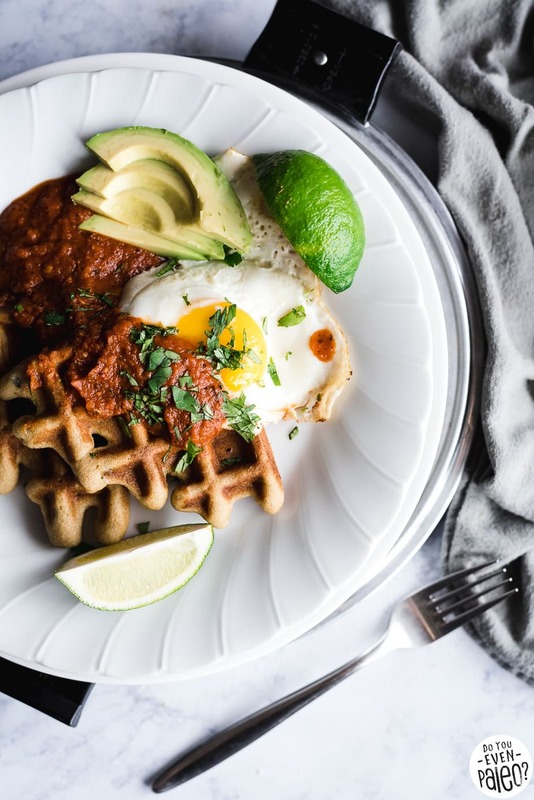 Feel free to add bacon or sausage or whatever to your waffle huevos rancheros. It may not be the traditional route, but this is YOUR breakfast. 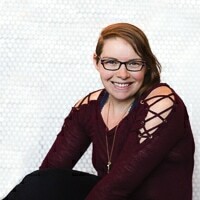 Do your thing! First, make the salsa. Heat the olive oil in a pot over medium heat. Remove the stems from the dried arbol chiles and chipotle peppers. Put all the dried chiles on a plate and microwave them for 30 to 45 seconds—this makes them more pliable and easier to work with. Slice each pepper open and discard the seeds (or leave them in if you’d like really spicy salsa). Slice the pepper flesh into strips. Add the dried chile strips, onion, and garlic cloves to the pot. Cook, stirring occasionally, for 8-10 minutes until the onion is translucent and garlic and chiles are fragrant. Add the fire-roasted crushed tomatoes, apple cider vinegar, cumin, and oregano. Let the mixture come to a boil, then reduce heat and simmer for 15 minutes. This is a great time to make the waffles if you’d like to multitask! Use an immersion blender to blend the tomato mixture until uniform. Stir in the fish sauce and salt. Heat olive oil for eggs in a skillet over medium heat. Add the eggs and fry until whites are cooked, but egg yolks are still golden and haven’t set. Transfer to a plate. 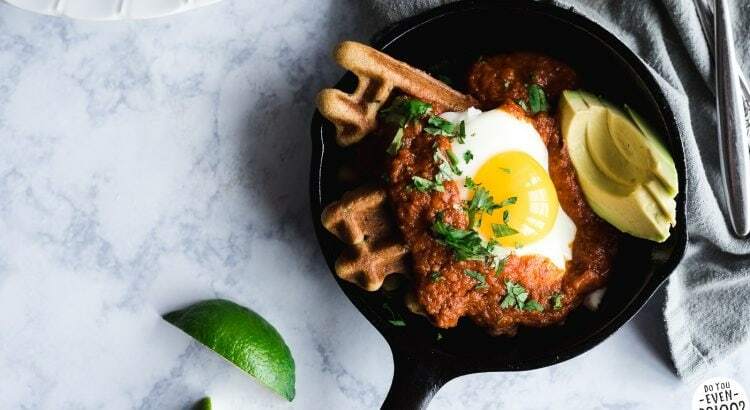 Assemble the waffles rancheros with a waffle per plate, topped with an egg. 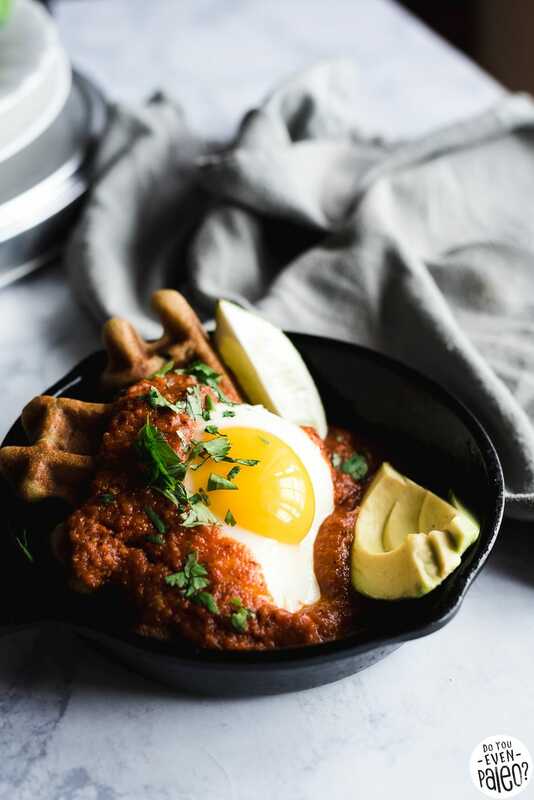 Spoon salsa over the egg and waffle. Garnish with avocado, chopped fresh cilantro, and a lime wedge. This sounds amazing! And that salsa looks really good, too bad we don’t have fire roasted tomatoes in the stores here. Bummer! I do link to where you can buy fire-roasted tomatoes on Amazon in the recipe. Otherwise, you can always sub in regular crushed tomatoes – though I’d probably add an extra dried chipotle to try and add a little more smokiness in that case! This looks amazing! It’s right up my alley! Don't subscribe All Replies to my comments Notify me of followup comments via e-mail. 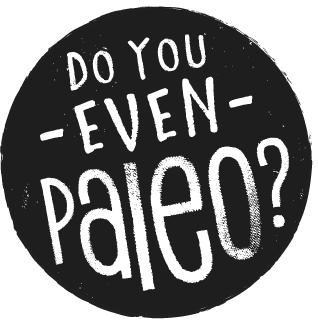 You can also <a href='https://www.doyouevenpaleo.net/comment-subscriptions/?srp=3934&srk=87505361eee98908ddf6ccb8681f50d6&sra=s&srsrc=f'>subscribe</a> without commenting.